Sleeping bags used to be simple, but these days there are so many styles that it’s hard to know which one will be best for you. Should you get a mummy bag? Does it need to be waterproof? How long will it last? So many sleeping bag questions! We looked up the ten most common things people want to know about sleeping bags and answered them based on personal experience. The answers will steer you in the right direction if you’re buying a sleeping bag, and will help you take care of it properly so it lasts forever. 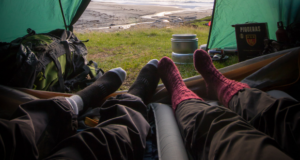 Are sleeping bags machine washable? You want to wash your sleeping bag as little as possible. There are two reasons for this. First, you want to keep the filling intact. Repeated washings can cause the filling to shift around and compress, which makes the sleeping bag less effective. Second, many sleeping bags these days have a waterproof coating that will wear out faster if you are washing the sleeping bag regularly. It’s easy to keep your sleeping bag clean on the inside. Wearing a base layer to bed makes a big difference because it will retain your sweat. You can also purchase a sleeping bag liner and then wash that after your trip. It’s also a good idea to turn your sleeping bag inside out and hang it up after every night of sleep. A dry sleeping bag is a warm sleeping bag. Lastly, if you must machine wash your sleeping bag use a front loading washing machine and clean it with Woolite on a gentle cold cycle. A front loader has less agitation, and it will be more gentle on the filling. Air dry it afterward. Yes, it takes longer, but it’s better for your bag. For more info check out our article on sleeping bag care tips. Can sleeping bags be dry cleaned? No. The chemicals used in dry cleaning will damage the loft (especial down) and will also wear down the waterproof coating (if your sleeping bag has it). Do not dry clean your precious sleeping bag. It will cry, and that will make you cry. Can sleeping bags be zipped together? Yes! As long as you have a rectangular bag, and they’re the same, you can definitely zip them together. Mummy style bags aren’t very comfortable when zipped together. With the right bag though, it’s a great way to get cozy! You should also consider a double sleeping bag if you’re looking to get your snuggle on. Can sleeping bags lose their warmth? Sleeping bags keep you warm because they trap air. If the loft becomes compressed, they will start to lose their insulating properties. Don’t store your sleeping bag in a super tight stuff sack. Make sure it’s a bit loose, or even better, hang it up if you have space at home. With synthetic bags make sure you always tumble dry on low heat, so you don’t melt the fibers. If they stick together, they become compressed, and you guessed it – less warm. They can be, but here’s the problem: you’re trapping a lot of sweat inside your waterproof sleeping bag. Remember – if they’re waterproof from the outside they’re waterproof from the inside too. Waterproof sleeping bags are great (and sometimes necessary ) for mountaineering and more extreme forms of camping. If you’re a casual camper, your best bet is to buy a tent that has plenty of space, so you don’t have to be touching the damp sides of it in the morning. Make sure you use a ground cover, and you won’t have to worry about your sleeping bag getting wet from the outside. Are sleeping bags safe for toddlers? It depends on how tall they are. This question is often asked because parents are worried about suffocation if the toddler crawls down into the bag overnight. We couldn’t find a single instance of that happening, and studies have shown that infant sleeping bags are actually safer than regular bedding, but there is another reason you should consider a children’s sleeping bag: warmth. If a child under five is in an adult sleeping bag, there is more space for cold air to be trapped inside. If you’re a three season camper and you camp often, you might want to consider a children’s sleeping bag for your little one. If you’re only out a few times a year in fair weather, you’ll be fine with a regular sized bag. What sleeping bags are the best? This is one of the hardest sleeping bag questions to answer, and it all depends on what type of camping you’re doing. If you’re mostly camping in the summer, a 50-degree rectangular bag is going to be the most comfortable. People often get carried away and think that they need a $300 0-degree mummy bag “just in case.” In reality, most campers are never going to need this level of insulation, and they’re going to be a sweaty mess when they try to use it in the summer. If you’re an avid three-season camper, a 30-degree mummy bag is a solid choice. You can use it as a blanket in the summer and in colder temperatures you can toss your base layers on, and you’ll still be snug as a bug in a rug. Great question and the answer is pretty interesting. In 2005 a European standard called EN 13537 came into effect, and the United States has since adopted it. They use heat sensor mannequins to determine how much heat is lost to determine the sleeping bag rating. The problem with relying too much on this standard is that everyone sleeps differently (hot sleepers and cold sleepers) and there are other factors that determine how warm you’ll be throughout the night. Things like your sleeping mat as well as when you last ate factor into how warm you’ll be. Which sleeping bag liner is best? That depends on what your goal is. If you’re trying to make your sleeping bag warmer (the most common use for them) Sea to Summit makes one that can increase your sleeping bag rating by up to 25 degrees. The nice thing about owning good sleeping bag liner is that you can use it as a light sleeping bag in warm weather. The other reason people buy sleeping bag liners is that they want a more sanitary sleeping experience. They’re very common at hostels, and are sometimes called “travel sheets.” They’re very light, and they’re great for backpackers who don’t want sweat and grime to make their sleeping bag dirty. They’re also popular with budget-conscious travelers who sleep in, let’s say, less than ideal accommodations. Are sleeping bags fire retardant? Yes. There is a mandatory standard that manufacturers must adhere to called CPAI-75 that was set by Industrial Fabrics Association International. It has been in place for over 30 years, and it measures burn rate. Samples are cut from the sleeping bag, laundered multiple times, and then held to a flame to measure their flammability. Thanks to this standard it’s one less thing you have to worry about when you go camping. Next: The Work Sharp Ken Onion Edition Knife And Tool Sharpener GIVEAWAY!